UK three pence, 1953. Portcullis and chains, symbol of the House of Commons. Portcullis and chains, symbol of the House of Commons. I am sure you are right, but didn't Henry VIII use it as one of his personal symbols? Also, there were some French and Israeli troops in Egypt along with the British. "The portcullis was the heraldic badge of the House of Beaufort. The first Tudor king, Henry VII (1457-1509), was of Beaufort descent and adapted both the portcullis and the Tudor Rose as the Tudor badge". Netherlands Antilles, 5 Gulden, 2013. 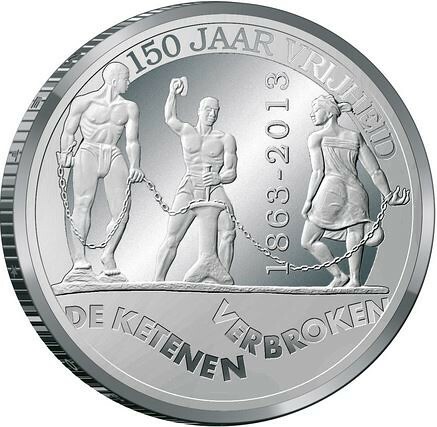 150th Anniversary of Abolition of Slavery and Liberation in the Dutch West Indies.